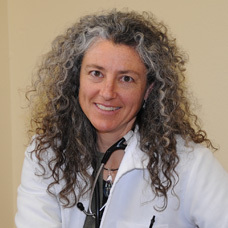 Our holistic veterinarian, Dr. Heidi Woog, is a 1998 graduate of Colorado State University College of Veterinary Medicine and Biomedical Sciences. She joined our veterinary hospital in 2008. Dr. Woog practices integrative veterinary medicine, combining Traditional Chinese Veterinary Herbal Medicine, veterinary acupuncture, nutrition, and chiropractic with her western veterinary medicine. Her internal medicine evaluations include ultrasound, radiology and blood chemistries. She has a special interest in integrating veterinary internal medicine with holistic modalities. Dr. Woog combines these modalities to improve the biomechanics and strength of working dogs, to enhance the movement and energy of geriatric animals, as a primary or adjunctive treatment for chronic disease patients, and for wellness and prevention in all animals. Dr. Woog has found acupuncture, herbs, and manual therapy to be helpful in pain management and neurologic disorders by improving strength and energy while providing more freedom of movement in patients with chronic pain and musculoskeletal disease. She combines herbs, acupuncture, and nutrition in her patients with cancer, immune-mediated disorders, skin diseases, and gastrointestinal disorders. In all animals, nutrition and Traditional Chinese Veterinary Herbal Medicine are used to support the body’s Wei Qi immune defense for prevention and wellness. Dr. Woog received her initial veterinary Traditional Chinese Medicine and acupuncture training through Colorado State University and was certified by the International Veterinary Acupuncture Society in 1999. She trained in veterinary chiropractic and manual therapy at Colorado State University as well. In 2005, she completed a Don-Low Fellowship in Nutrition at the U.C. Davis Veterinary School Nutrition Department; this valuable information has enhanced her ability to support her clients’ nutrition, including consultations on how to prepare a homemade diet. In 2008-2009, Dr. Woog enhanced her knowledge of veterinary Traditional Chinese Herbal Medicine through Dr. Xie’s Chi Institute in Florida. Dr. Woog has been an active volunteer with search and rescue teams in Colorado, California, and Idaho for the past 16 years. She is currently active with Blaine County Search and Rescue, Galena Back Country Ski Patrol, the National Search and Rescue Association, and the National Search Dog Alliance. The time she has spent with search and rescue has given her an inside look at working dogs and their particular physical and emotional stresses. She brings this knowledge into her veterinary practice as well. When not working with patients at the clinic or helping with Blaine County Search and Rescue, Dr. Woog enjoys time with her husband, Dr. Tom Archie, and son, Holden Archie, Certified Search and Rescue Canine Companion, Ashmor, and family equines, Zeuss and Big. As a family, they spend much time enjoying the outdoors through skiing, hiking, bicycling, equine events, and backpacking.